Just as Aussies stole the pavlova, we have also stolen the card game 500 and made it our own. While it is considered to be the national game of Australia, it actually originated from the US with the United States Playing Card Company holding copyright up until the 1960s. In case you’ve been busy advocating for the pavlova to be an Aussie dessert and missed learning about 500 and even how to deal it, we have all the rules to the game here. Unfortunately, it isn’t available to play at reputable web casinos just yet, but with so many catering to Aussies, it could soon be hitting iGaming catalogues. The main aim of 500 is to reach a total point score of 500, which is done similar to Euchre (a game said to be responsible for introducing the Joker in a deck of cards) in that the Joker trumps all. If you know how to play Euchre, then you will pick this game up quite quickly. However, there are rule additions which makes 500 a game on its own. There are a number of elements which need to be factored in when playing 500. Additionally, there are a number of variants which can see alternative rules in play, though we are specifically talking about the Aussie version here. In Australian 500 there are generally four players, which play in pairs and sit opposite to one another. In other variations the numbers of players can vary, however for the Aussie version it is usually four. Regardless, be sure to follow the rules that fit with the number of players. 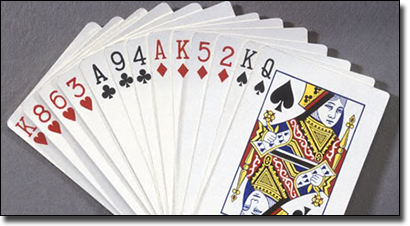 How many cards there are depends on the number of players, but for four players a deck of 43 cards is used and sees all twos and threes removed from all suits, and fours removed from the black suits. Therefore, there are cards from four to Ace in the red suits, and five to Ace in the black suits, as well as a Joker. The Joker is known as the bird in the Australian variant, as the Joker in the original Australian deck of cards is represented by aKookaburra, rather than a Jester in international decks. The Joker beats all cards, while next in line winning all is the Jack of the trump suit. A trump suit can be bid on and the highest bidder in terms of tricks and suits (or No Trumps depending on the bid, which we explain below) will kick the game off and if there is a trump suit it works, for example, by trumping another player’s card of a different suit that has been placed down already. You win as you had the trump suit. We will go into more detail about bidding for the trump suit below. The next card ranking is the Jack of the same colour as the trump suit played, then when there are No Trumps left (or No Trumps in the beginning) the cards rank in the usual order of Ace to four or five, with the exception of the Jack. The suits ranking is outlined below. So now we have detailed the elements of the game we are going to detail how to play. There are three parts to the game and include dealing, bidding, and of course playing. The initial first dealer is picked at random and they are required to shuffle and deal 10 cards to every player. The three leftover are to be placed in the middle of the table and these are known as the kitty. Dealers generally deal three to each player, then one card to the kitty, then four more to every player, then another to the kitty, and then three more to every player, and finally one to the kitty. The first bidder is the player which is to the left of the dealer, and this continues in a clockwise formation, where each player can choose to bid or to pass. The bid will indicate what you think you can take in terms of tricks. Players can also pass, and if all players pass then the cards are discarded and a new games starts up. If just one player passes they cannot bid again in the round. The highest you can therefore bid is 10 No Trumps, while the lowest is six Spades, and bidding continues until everyone has passed bar one, who ends up being the highest bidder and enters the contract, which is the leader of trick, as we continue below. Additionally, from the list above, there are two special bids that also have value in an auction. While you are stating that you think you will lose all tricks, this bid is considered to be higher than any bid of seven, so seven Hearts, Diamonds, etc, but lower than any eight bet, such as eight Spades. However, it cannot be made when a six tricks bid has been made. The Open Misere which is the same as a Misere bid, but you lay your hand on the table, is valued less than 10 Hearts but higher than 10 Diamonds, and can be made over any bid that is considered to be lower in value. The contractor, which is the person who won the highest bid, picks up the kitty (three cards in the middle) and can either discard three of their own and replace with the kitty or pick and choose what they keep of the kitty and what they remove from their hand. At no time should the contractor reveal any of these cards, replacing the kitty with the discarded three cards in the middle. Depending on the bid the partner plays, or if a Misere or Open Misere won, then the contractor plays without their partner and their partner places their cards face down on the table. After the first trick has been played for the latter bid, the contractor must reveal their own cards and play with their hand revealed to everyone. The contractor then plays the first trick and in a clockwise formation players have to follow suit if possible. If they don’t have the suit they can play any card. To win the trick, you need the highest trump, or the highest card of the suit if no trump is in play. The winner then gets to play the next trick. However, the Joker plays a major part in the game and can stop someone from winning. If a trump suit is in play during the trick then players can place a joker and this card will trump all, since it is the highest trump card as we stated above. If there are No Trumps in play or a there is a Misere or Open Misere then the joker can be played by the contractor by picking which suit the joker belongs to, making it the highest card of that suit, but this has to be before the first trick. Finally the aim of 500 comes into play. To win, one of the partnerships needs to reach 500 points when they have kicked off as a contractor. Unfortunately it isn’t possible to win if you aren’t the contractor (the leader of the trick) regardless if you have scored 500 points. To score points, players make their bid and begin the contract which they have won the bid for. If they win the contract and win the amount of tricks specified then they win the appropriate amount of points according to the table below. Opponents score ten points per trick they win and even if the contractor wins more tricks, they do not score extra points than they said they would win in the bid, unless they win a slam which is where they win every trick and their bid is valued at less than 250 points. This means they will then receive 250 points instead. Once the contractor has 500 points, they win.